When your PrestaShop website has a blank screen or a 500 internal server error, you can debug it with PrestaShop debug mode. PrestaShop has a nice little utility built in that will show you exactly what is causing the error. Also, what is great about PrestaShop is there is a very active community, so if you do not know how to fix the error you can post the error message to the PrestaShop forums and more than likely someone will know and assist you. To turn on debug mode you need to be familiar with how to FTP into your site. We recommend using FileZilla for FTP, it is the most popular FTP program. Once you FTP into your site, you will want to find the config directory and enter into it. 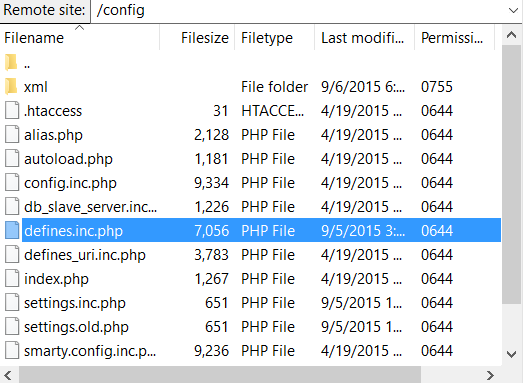 Inside that directory there is a file called defines.inc.php, refer to the screenshot below. Right click on the file and choose edit. Once you start editing the file it will look like this the screenshot below. You will want to change the part with the arrow that says false, to true. Then save the file and Filezilla will ask if you want to upload it. Choose yes. Now if you reload the part of your site that was having the issue, you should see an error message like below. From that error message you can start to figure out what is wrong. If not you can either post on the forum or contact us about support for your PrestaShop store.